Sure, Visio text has tabs, which we’ll put to use. But in the wrong hands and on the wrong shapes, tabs can blow up in your face! But never fear, for today we introduce the concept of Smart Tabs. Smart tabs are tabs that organize your text properly, even when your shape changes size! We won’t go into the details of linking text to data in this article, since you’ve got these other articles at your disposal. Visio shapes can not only contain data in Shape Data fields, but they can also link that data to text that is displayed on the shape itself. But often times we want to show more than one field, and give descriptors to each field to boot. As soon as we have multiple fields, we also want to control how they are positioned and organized on the shape–preferably in neat rows and columns. In a web-page or Word document, you’d simply insert a table. 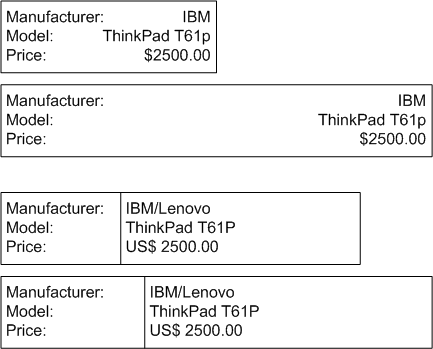 But Visio doesn’t support tables in shape text blocks. You could use multiple shapes to form rows and columns, but this gets inefficient, and the linking of Shape Data fields to so many separate shapes can be tricky, confusing and lots of work! So let’s get to illustrating the problems and solutions, since we are Visual People! Below, we see two shapes that both contain a field-name and a field-value. These text items could be linked to real data stored in the shape’s Shape Data fields. They are both efficiently constructed, having two bits of data are stored in a single shape. Note: The second shape is a single shape, not two rectangles. It was created by drawing a rectangle, then drawing a vertical line 1/3 along the way from the left, selecting both shapes at once, and finally choosing: Shape > Operations > Combine from the menu. 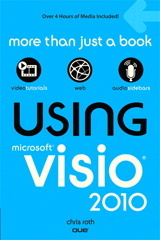 We can accomplish this by using Visio’s Text Ruler, which is similar to that found in Microsoft Word. Since each shape has a slightly different tab setup, let’s look individually at how each one was configured. In the first shape, the tab is set to right-aligned, and located such that the field-value appears at the end of the shape. The field-name is at left and doesn’t require any fancy configuration, other than that the entire shape is set to left-aligned paragraph text. That wasn’t so hard. And the shapes look much better already! Both of these shapes are now good candidates to be parts of a title block, whose data fields get populated in any number of ways. A user might manually enter values in the Shape Data window for the title block shape, or an automated solution might programmatically set the data when, say, a new project gets created. Tabnation! What Happens When the Shape Changes Size? Now we’ve got two fine-looking shapes. Both with two fields and one tab stop. These shapes are likely to be parts of title blocks on the drawing, and are likely to change size depending on the paper size, the available space on the drawing, or the whims of the user. What a mess! In some instance the field-values have just stayed put, ignoring the size of the shape. In other instances, they’ve jumped around randomly. You can see that the first shape’s field-value does not stay aligned to the right side of the shape, and the second shape’s field-value doesn’t match up with the vertical line. Something’s got to be done! That definitely looks much better! And Smart Tabs are the way to get this to happen! In order to create the smart tabs, we start with the shapes that we’ve already created– inserting tabs and specifying their alignment. Nothing special about that. Once that’s set up, we then must venture into the ShapeSheet and smarten-up the tab-stop positions by using ShapeSheet formulas. If you select a shape such as one of the two blocks we’ve been talking about, then choose: Window > Show ShapeSheet from the menu, you’ll be presented with a big, scary Excel-spreadsheet-looking interface. About half-way down, you should find a section called Tabs. If you don’t see this section, go to View > Sections and click Tabs near the bottom of the middle column of check boxes. The first column in this section is called Position, and it is the position cells that we are interested in. As they stand now, the position cells will contain fixed values. We want to change that by creating smart formulas that make these positions dynamic. GUARD protects the expression from being overwritten, especially when the shape is duplicated. Since the text should be all the way to the right of the shape, we set the position to Width, which is the length of the shape. But the text block is slightly less than the width of the shape, due to margins, so we subract off LeftMargin and RightMargin to get things just right. If you peruse the ShapeSheet some more, you’ll find that Width, LeftMargin and RightMargin are all cells in the ShapeSheet. Just as in Excel, you could have built the formula by clicking on those cells while entering the expression. In this case, only the LeftMargin figures in to the correction, since we are only locating the tab relative to the left side of the shape. With smart tabs, your shape’s text is well behaved. And without building-in any more smarts, your shapes are more capable than you think! You’ll note that the “1/3” shape is a bit restricted, because, in this example, the field names are comparable in length to the field values. So the 1/3 location doesn’t make a lot of sense, and wastes a lot of space. Since the “1/3” shape potentially wastes all that space, we can parameterize the location of the divider-line, and thus the location of the tab. What follows is a brief description of how we could improve the second shape even more. I won’t go into gory details and tons more pages. But I’ll point you in the right direction and hit the major points of what needs to be done. Users can simply tug on the control handle to move the line and the corresponding tab stops, but only after we link tabs and geometry to the control handle. We inserted this control handle using the ShapeSheet’s Insert > Section command. We then gave the new Controls row the name of dividerPosition. The row name is the red text on the very far left of a row. You type in “dividerPosition”, then hit enter. You’ll then see “Controls.dividerPosition” when you’re done. But you don’t need to type in “Controls”. Most of this should look familiar, except that now we are adding and subtracting Char.Size/2. Char.Size is just the font size for the text. You’ll find the Char.Size cell in the Character section of the ShapeSheet. I’ve used it in our smart tabs so that the text isn’t jammed up against the line, but instead leaves a bit of space. We could have subtracted and added a fixed value, like +/- 2pt, but I figured it would look better if the spacing grew and shrunk proportionally to the size of the font. So you want to make one big title block with lots of different fields, it sounds like. When you drop or copy the grouped shape, Visio will prompt you to fill in the Shape Data fields. Step #5 is perhaps the most complicated part, which I need to address with an article one of these days. I have created a new title block stencil to use for engineering drawings for work. It has a border that is about 3/8″ from each edge of the paper and a title block that shows our company name, title of drawing, date, scale etc. I typically print my drawings on 8.5″x11″ paper. Occasionally I need to change the drawing scale so that whatever I’m working on fits on the paper size I am using. When I change the drawing scale say from 3/8″ = 1′ to 1/4″ = 1′, the title block “border” stays the same but the title block itself adjusts with the drawing scale. I have to ungroup my title block stencil, manually resize the “title block” portion and then regroup. How can I set the title block so that it “acts” the same as the border when I change the drawing scale? This is a good question, and the answer isn’t super-simple, but perhaps I’ll give you a few clues and hopefully not sound too obscure. The idea with title blocks and borders is that they are not part of the scaled world. I usually put them on a background page that is not scaled, for simplicity. If you have a title block on a scaled page, though, then the concept is that the title block should be, say 3in x 5in in PRINTED size, no matter the scale of the drawing. You are seeing this happen with the border you are using. The GUARD will prevent you from manually resizing the shape, so the “3 x 5” should be changed to match the real size of your title block. To control location, you can use this anti-scaling formula for PinX and PinY as well. Hope this sheds a bit of light on the mystery! Early in the comments you mention a deeper discussion of inserting text into sub-shapes. Have you done that yet? No, I don’t think I ever got around to it. The problem with sub-shapes is that you want to display info from the containing group. However, Visio’s Insert Field dialog does not list Shape Data and other info from the group, just from the sub-shape itself. So you can’t easily pick from a list, which is a pain. So you have to do a Custom Formula, in which you know the id of the group, and the name of the Shape Data row, from an internal point of view. Where Sheet.1 is the name-id of the group, and Row_8 is the Shape Data row that contains the Cost information. Weird, huh? Also related: What’s My Shape’s ID? Thanks for that info. It works well. Thanks for these instructions! I got them to work in Visio Professional 2016, as well. However, I couldn’t copy/paste your Tab.Position formulas, as the minus sign (-) in the formulas copies as an en-dash or some similar extended character.